1. A concave triangle supporting a corner of a circular dome built over a square space. 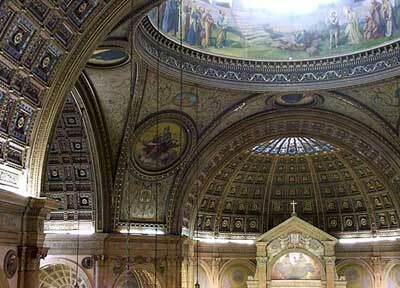 A triangular curved surface between two arches and beneath a dome. 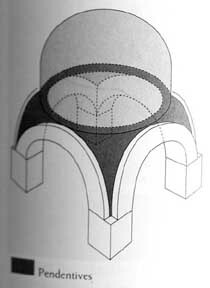 The concave triangular sections of vaulting that provide the transition between a dome and the square base on which it is set to transfer the weight of the dome. 2. A pendentive is a constructive device permitting the placing of a circular dome over a square room or an elliptical dome over a rectangular room. From the Latin "pendens," which means "hanging." The domes of earlier, central plan buildings, like the Pantheon and Santa Costanza, spring from the circular bases of a continuous wall or arcade.